Nose: Sweet, Fruity, Floral, Waxy and a bit Musty. I detect a very light Sulphur note but it's nothing serious. It's not really an overwhelming Nose and the Alcohol is quite present. I find slightly Burnt Toast, Toasted Cereals, Sawdust, Straw, Salted Nuts, Brown Sugar, Toffee, Tobacco, light Leather, Green Apple, Papaya, light Pineapple, Dried Fruit (Raisins and Apricot), Citrus, light Honey, Syrup, Starch, Wet Cardboard, Varnish and light Spices. Most of the Aromas are mere hints. In the background I find a very light Earthy Peat. On the Nose, the 15 Years is not really my kind of thing. I liked the 10 Years a lot better. Palate: Here, the Mild Smoke, Dry Peat and Sulphur are more noticeable. On the Palate, this Springbank is Bitter Sweet, slightly Sour and Spicy with Toasted Barley, Nuts, Cereals, Lemon, Grapefruit Juice, Papaya, Melon, light Leather, Tobacco, Dried Fruit, Oak, Ashes, Dried Herbs, Aniseed, Menthol, Pepper, light Licorice and Nutmeg. Again, the Alcohol is quite present. Finish: Bitter-Sweet, slightly Sour, Nutty, Spicy and Dry with Malt, Nuts, Cocoa Powder, light Peat and Smoke, Tobacco, light Ashes, light Leather, Salt, Pepper, Cardamom, Oak, Alcohol, Dried Herbs, Menthol and Licorice. I added a couple of drops of water and the Nose becomes Fruity and Floral. On the Palate, Oak, Peat Smoke, Malt, Fruit and Spices are a bit more Balanced. The Finish becomes Short and Boring. Still, there's room to play with a little Water. General Remarks: The Campbeltown region is the most southerly point on the west coast of Scotland. 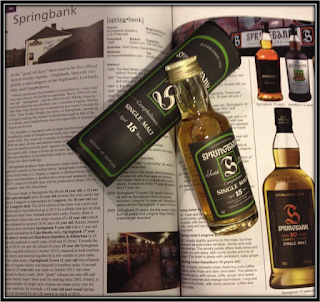 Today only three distilleries remain in the area namely Springbank, Glengyle and Glen Scotia. 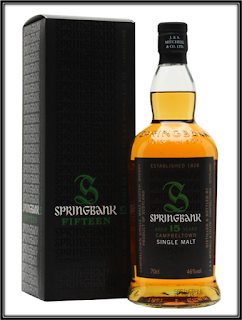 Springbank is the only distillery left in Scotland that malts all its Barley. The whisky is distilled 2,5 times. 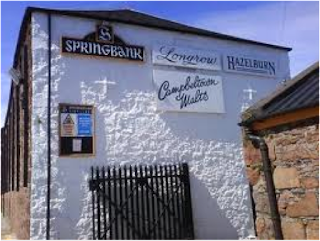 The distillery also produces Hazelburn and Longrow. The latter two each represent around 10% of the production. A lot of Springbank Spirit is used for the Campbeltown Loch Blend. The core range of the distillery includes the 10,15,18 and 21 Years as well as a 12-Year-Old CS. The average price of the 15 Years is around 80 US Dollars but it can get as high as 140 US Dollars depending on where you live. It matures in Ex-Oloroso Sherry Casks and is not Chill-Filtered. Conclusion: I bought this Miniature bottle a couple of years ago. Most likely it was bottled in 2006/2007. The impression I have is that quite a lot of Refill Casks were used to mature this 15 Years. The Sherry notes are there but they are not very clear. I must admit I had high hopes when I started the Tasting Session, as I really liked the 10 Years that I reviewed some years ago. But I'm quite disappointed to be honest. Five extra years in refill casks didn't serve the Spirit well. I find the 15 Years to be lacking in confidence and I miss balance as well. It's a bit of an expensive weird mixed bag of Sweet, Bitter and Sour. As such I can't really recommend it. I'm sure there are quite a lot of people who will like this expression as Springbank has got some cult status worldwide. But I'll stick with the 10 Years for the time being!